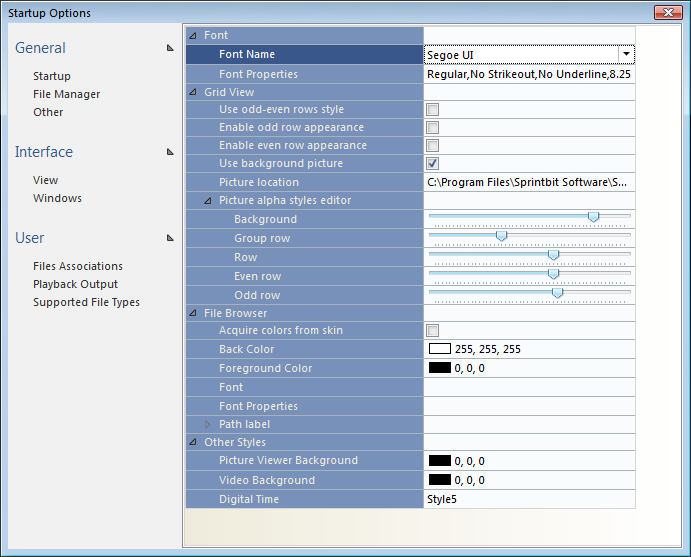 The visual options of some of interface components of Sprintbit File Manager can be set by using this window. To set a property value use associated editors with options rows. Each row has either a check mark, text box or drop down menu associated. Row's editor may be not visible all the time but becomes when you click on a row. Sprintbit File Manager provides options to control the colors and font styles (bold, italic and underline) used generally by all software interface elements. Sets the font. To choose a font click on a row and choose a font from drop down list. Also you can type the font name directly into a cell. When this row is selected then a font properties button will appear on the right side of the row. Click that button to open a dialog window where you can set the font style, size and set the font name as well. Grids use a style model to simplify customization of grid's appearance. here you can set some of the options to change the appearance of grids. The Grid can alternate background colors for its rows The Even Odd Style property controls how is this alternating applied. Set whether even-odd style is used or not. If you have enabled Use odd-even rows style then you can also control whether a grid will paint all rows or not. check this check mark to enable odd rows to be painted. If you have enabled Use odd-even rows style then you can also control whether a grid will paint all rows or not. check this check mark to enable even rows to be painted. If selected then program will use the background picture for grids. When this row is selected then an open file button will appear on the right side of the row. Click that button to open a dialog windows where from you can choose an image file to show as grid background. The alpha blending feature enables you to enhance the appearance of the grid background by painting its elements using transparency. For instance, you can change the appearance of column headers, rows, cells etc. To change it, first you have to set a background picture an enable Use background picture property, next you can use a slider to set the transparency of particular element. These options below will set the appearance of all File Browsers and Tree Views in all software features. If checked then software will set the background and foreground color of File browser that will match colors of current software skin. If not checked you can set colors manually using options below. Sets the background color. To choose a color click on a row and choose a color from a drop down colors picker. Sets the fore color. To choose a color click on a row and choose a color from a drop down colors picker. Sets the font for all browsers. To choose a font click on a row and choose a font from drop down list. Sets the color that will be used as background for all picture viewers. To choose a color click on a row and choose a color from a drop down colors picker. Sets the color that will be used as background for all video players.